Using an umbrella while hiking is a religious debate. Some folks swear by it, others just swear at it. I've always carried a raincoat with hood and never considered using an umbrella until recently. 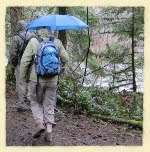 That is because, when I think of umbrellas, I think of rain but there are many other uses for an umbrella and I expect I will carry one on my Arizona Trail trek. Snow Protection - Snow dropping off the umbrella doesn't accumulate on your head, your pack, or your shoulders, sucking heat from your body and melting. You stay dry and warm. Sun Protection - This is how I plan to use one. 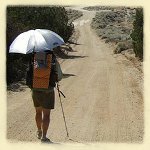 In arid areas and at high elevation an umbrella can keep you cooler while hiking and prevent sunburn without greasing up with lotion. At camp, posting your umbrella makes a great shade spot - invaluable on a desert hike. Ventilation - Unlike a rainsuit, an umbrella doesn't trap your sweat to your body. You can wear lighter clothes for the temperature and keep the rain off your body. This is especially true in hot, humid areas. Tarp Pole - Your umbrella can hold up part of your tarp. Or, open it and deflect most of the rain or wind entering your vestibule area. Notoriety - "Hey, did you see that guy with the umbrella?" - folks will remember you. Hand Fatigue - Your hand might get tired carrying an umbrella for hours. You can't carry an umbrella and a hiking pole in the same hand. So, you need to use just one pole at most, or figure a way to attach the umbrella to your pack or body. There are head umbrellas and hands-free umbrellas available now. I will attach my umbrella to my pack strap. Wind - This is the one downfall of umbrellas. There's no way I know of to use an umbrella in robust wind. The tugging and yanking makes for a long day, increasing the amount of concentration needed. Snags - In the woods, tree limbs can poke, tear, and ripe umbrella fabric. Out in the open, there's no problem but in forest, care needs to be taken. Style Points - you might get some weird looks, but I don't think an umbrella looks much sillier than a floppy, wide-brimmed hat. Well, maybe if you showed up with a Hello Kitty umbrella. It's important to take what you need and need what you take. Checking the weather forecast, being aware of the general weather where you're hiking, and familiarity with the terrain will all help you decide what gear to take. If you've already decided to take a full rainsuit and pack cover because rain is expected, then an umbrella would be extra weight. If you expect nice weather with possible rain showers, then you might leave the rainsuit at home and opt for an umbrella. For desert treks, silver-coating is available on umbrellas to reflect heat. You also might strip down an old umbrella and fix up your own super-light shade umbrella that handles wind a bit better. Sections of silnylon on an old frame that allows air to blow through could be a super sunshade and adequate rain protection for light rains. Golf brollies are cheap and light if you get one with a carbon stem and you can cut the handle and point off to make it less of a problem to strap to your rucksack. When you get used to them you can use them in even strong winds as long as they're not gusting. Apart from your legs you can stay bone dry even in rain that's lashing down, and shorts save you having uncomfortable wet trousers anyway. Good Goretex waterproofs are expensive, heavy and horrible to wear and you can still tear them on barbed wire. I'll go for an umbrella most of the time. Decided to do a long desert hike from Death Valley to Inyo. As you mentioned above, I used a large aluminum flash reflector umbrella with Gold reflection on the top. Didn't feel the sun heat penetration coming through. Although the air temperature was still 117 at the beginning of the hike cooling to 95 towards the end. That umbrella was an important piece of equipment as well as a pressurized water bladder to mist, spray and rise eyes and cool other parts of the body.